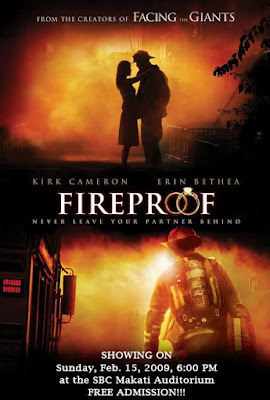 A week ago, I saw the movie "Fireproof" and was touched and reminded about the commitments I made to my wife. I especially liked the parallelism made between marriage and the job of a fireman which both experience 'fires' and the application given was to 'never leave your partner behind'. I was glad to have watched that movie with my wife and since we both saw how it nice it was, we wanted to share it with other couples at church. On Sunday night, during our usual evening service at 6:00 PM, we will be having a movie night service at our church in Makati. We invited as many couples as we can and the mother's group in our church will be taking care of the popcorn so that those who will join us for that event can enjoy "Fireproof" and popcorn at the same time. We really thank God for the new Acer X1160Z multimedia projector that we can use in church. We just hope we'd be able to purchase a computer that can be exclusively used for that projector which will be put to the test this Sunday night. This movie night event is free of charge, so if you feel like joining us, our church is located at the 3/F 9642 Kalayaan Talipapa Bldg., Guadalupe Nuevo, Makati City.